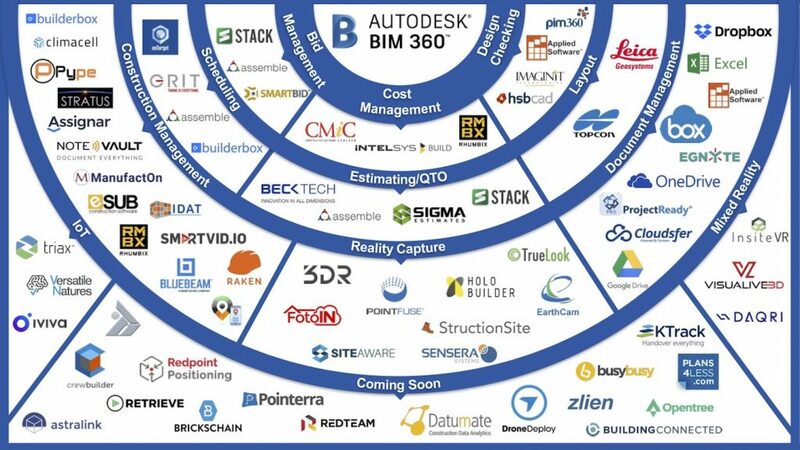 BIM 360 Highlights Year of Innovation in Construction Project Management – What’s Next? As we begin one of our favorite weeks of the year, bringing together more than 10,000 customers and partners at Autodesk University 2018, we wanted to look back at highlights of the past year for BIM 360. Thirty-three releases, more than 130 features and 60 new software integrations highlight a year of rapid development and partnership with our customers. Together, we’re delivering technology that supports key construction workflows by centralizing project information for all stakeholders and by opening the door for innovation through greater access and analysis of project data. Last November, we announced a preview of the next-generation BIM 360 platform, a complete re-engineering of our BIM 360 products onto a common data platform, connecting design and construction processes, teams, and information. And today we’re thrilled to announce that we are adding support for another key construction workflow – Cost Management. 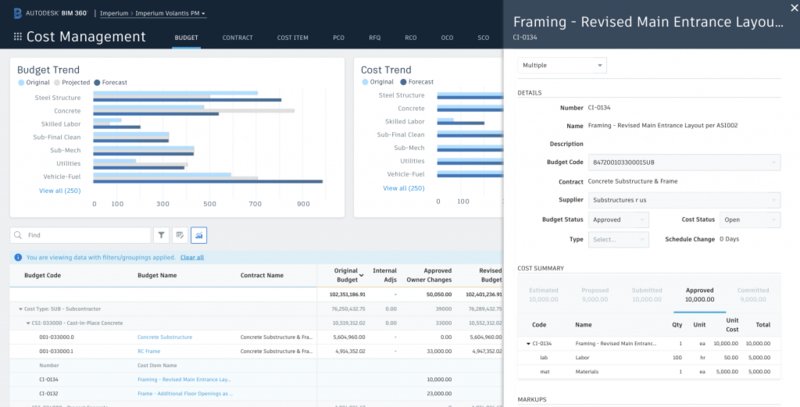 Keeping projects on budget requires close management of budget items, and this new capability brings contracts, budgets and change order management into the BIM 360 platform. This module will be offered as a limited availability pre-release in December, and customers interested in exploring the capabilities should contact bim360costmanagement@autodesk.com. New cost management capabilities in BIM 360 add powerful change management workflows and reduce risk by enabling teams to manage all cost related construction activities in a single software experience, providing real-time visibility into the financial health of the project. Supporting core AEC project workflows in a single platform is just one element of the BIM 360 platform. Built on Forge, BIM 360 fosters a collaborative development environment within the ever-growing software ecosystem. Since the introduction of the BIM 360 Integration Partner Program last year, we’ve added 60 new software integrations, bringing the total construction partner ecosystem to more than 100 partners. BIM 360 now connects to 3DR, DESTINI Estimator, BuilderBox, EarthCam, Egnyte, FotoIn, HoloBuilder, SiteSense, NoteVault, OnTarget, Pype.io, Sensara, Triax with many others in development. BIM 360 supports a robust partner ecosystem that we are building out through our own software development efforts and through key investments, integrations and partnerships. These integrations make project information from across the software ecosystem available in BIM 360, building a single source of truth and allowing customers to tap into the insights from across their innovative construction technology. Our work with the software ecosystem is also aimed at providing the most comprehensive support for connected business processes. To support this, we’ve made some important investments through the Forge Fund in companies like eSUB, ManufactOn, Smartvid.io, Rhumbix and Project Frog. These software companies are delivering innovative, cloud-based solutions that are advancing approaches to construction project delivery. Our most significant investment in the partner realm this year was our acquisition of Assemble Systems. Combined with the robust information that is developed using Revit, Assemble Systems’ technology enables 4D & 5D estimating and scheduling to help construction project teams plan projects, manage bids, estimate costs and carry out assembly works. Assemble provides a SaaS solution that enables construction professionals to condition, query and connect BIM data to key workflows across bid management, estimating and scheduling. By consuming models, drawings, and point clouds in an easy-to-use cloud-based environment, Assemble helps extend BIM resources across the entire project team, eliminating challenges during design, preconstruction and construction. Prior to these new features, BIM 360 users were able to aggregate models, automatically run clash detection as models are published, and view clash results – all of which have been part of Model Coordination since the preview announcement last year. 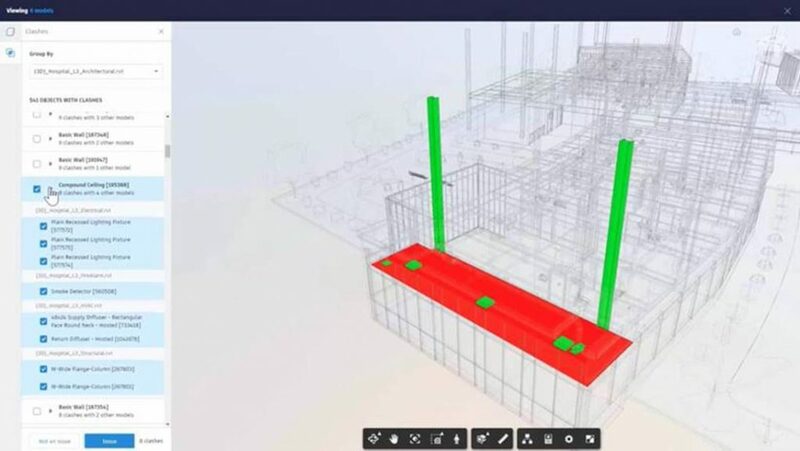 The ability to support coordination workflows for multi-format 3D models is a big differentiator for BIM 360 over more traditional construction management apps that are more purpose-built for 2D workflows – and may just have 3D viewing capabilities bolted on or available through partners. BIM model coordination is one of the highest value workflows for GCs, subcontractors and fabricators and is required for workflows across the project lifecycle – design, quantification, scheduling, fabrication, on-site layout, installation & commissioning. While Autodesk continues to find solutions to the problem you struggle with today, we are also keeping an eye out towards the future. Today, software helps to manage RFIs and change orders, but we are exploring the use of predictive analytics early in the coordination phase to eliminate costly RFIs and change orders before they occur. Autodesk customers already deploy our powerful machine learning and AI capability found in BIM 360 to improve safety and quality, and our customers are asking us to explore the same for model coordination. We’re on it. Digitizing processes and centralizing data is the path to predictability. The BIM 360 platform is built from the ground-up to centralize your project data – starting with the Revit model and building on that initial set of design intent, adding to it during preconstruction and fabrication, and collecting critical information on the jobsite to make real-time decisions. 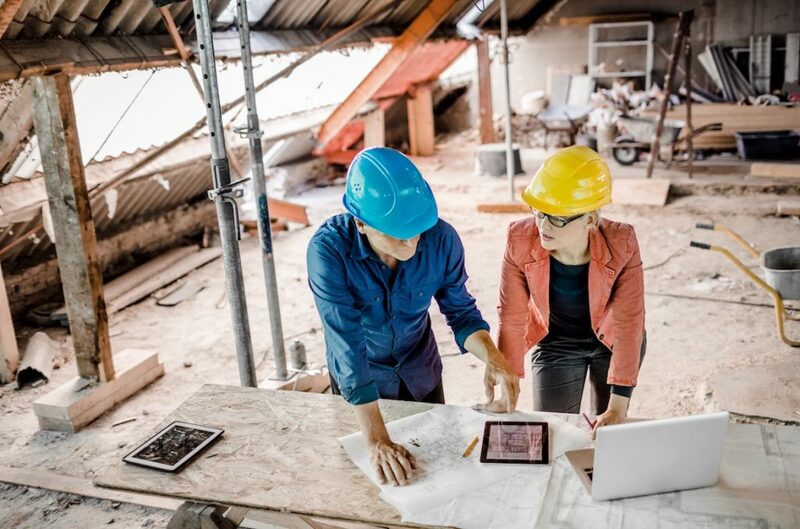 The BIM 360 platform, and its tighter integrations to Autodesk’s world class authoring software, helps our customers centralize project data to connect, organize and optimize their projects from start to finish. This connected approach is the path to predictability, leading from digitization of information and processes, to integrated and more automated workflows, and an ability to extract actionable insights from data across the projects to optimize for continuous improvement.